At Great Lakes we serve both the general contractor and homeowner and we pride ourselves in finding you the right tool to get the job done. We also sell parts, materials, and accessories to go with your tool rentals, from sanding discs to hard hats. Is it your choice to buy, not rent? We represent several major manufacturers such as RedMax, Billy Goat, and Wright. Don’t forget to celebrate when the work is done! We have a great variety of party and event rentals; please visit our Party Rentals website! Ready to get started? 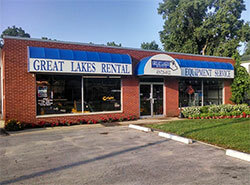 Browse our extensive equipment rental and tool rental inventories and start a quote request. Or, give us a call! Our experienced and helpful staff are here to help you!